Summary: The walk leaves Settle and heads north firstly alongside the river Ribble then over fell to the foothills of Pen-y-ghent. This magnificent Dales hill is climbed and then left by tracking east to Hull Pot and then south into Horton in Ribblesdale. From the village leave by crossing the railway line at the station and climb gently onto the fells and magnificent limestone outcrops at Sulber Nick. A choice can be made here. 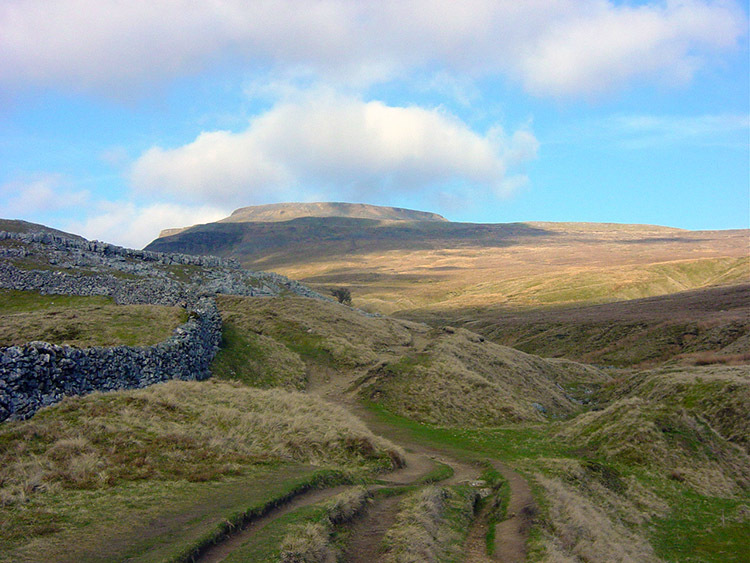 Add two miles by tracking south west to Trow Gill and then north west to Gaping Gill before ascending Ingleborough. 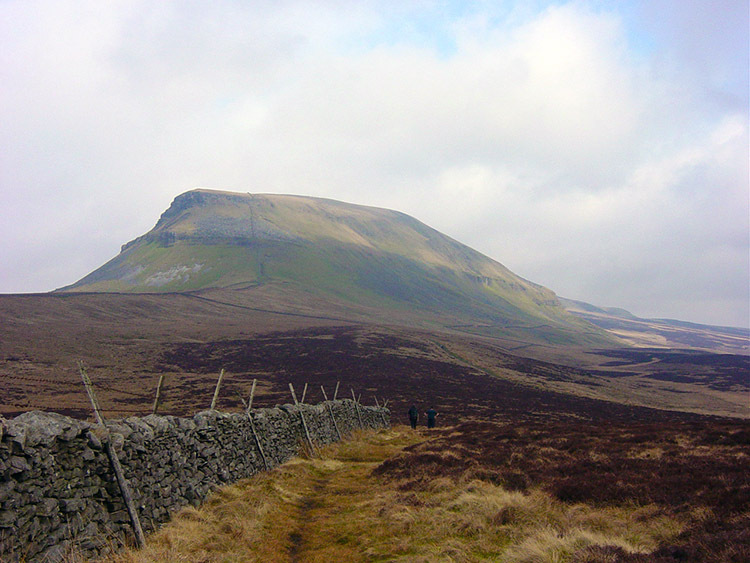 Alternatively continue from Sulber Nick directly west to Ingleborough. From Ingleborough's distinct table top summit head down due west into Ingleton. The Walk: We had stayed the night at the Golden Lion Hotel in Settle. The Golden Lion is a traditional Yorkshire Dales Coaching Inn and in its advertising literature prides 'food a speciality'. True to its word the full English Breakfast which Chris, Lil and I enjoyed was well cooked and fulfilling. However Steve has now turned hybrid veggie as he can still have fish and so ordered the smoked haddock. The genial and efficient head waiter of French or Italian origin took his order and only after a full five minutes or so came back to tell Steve he couldn't catch the fish! Steve was not pleased and so grumbled his way into ordering what he could. From this day on throughout the walk he would always raise the issue of catering for vegetarians properly in accommodation. I'll make it a point of note in my future accommodation guides for walkers Steve. Apart from enjoying my breakfast I also was pleased to receive a great and thoroughly appropriate birthday present from Lil. She presented me with a 'Walking Englishman' T Shirt. Thanks Mrs Brockhurst, I'll wear that with pride. Anyway, that's enough about breakfasts and birthdays, now back to the walk. After saying goodbye to Lil Chris, Steve and I left the Golden Lion Hotel and walked out of Settle towards Giggleswick. We were a little stiff in our legs and certainly had drowsy heads from the ale of last night as we ambled through the town but I knew if yesterdays opening 19 miles hadn't got our muscles working properly then today's 19 miles certainly would for the highlight of this second day was the challenge of completing two of the Yorkshire Dales noted 'Three Peaks' (the 3rd peak also lies in our path on this challenge). As luck would have it we had fairly easy walking for the first few miles following the River Ribble to Stainforth and I am sure the boys were as pleased about that as I was as we toddled off the footpath at Settle Bridge and began our walk along the river following the Ribble Way footpath. We followed the river to Langcliffe Mill while we enjoyed the views of the limestone cliffs of Stainforth Scar and then walked through a caravan site full of walkers from the Selby Walkers Club who were setting off in the same direction as us. They were family groups with children and dogs in tow and surely not going as far as us today but they were still about when we reached out first scenic feature of the day, the lovely waterfall at Stainforth Force. We enjoyed a break at the waterfall and then waited at the gap in the wall at Stainforth Bridge while a group of the Selby Walkers passed through before us. We then passed them up the short but steep road climb into Stainforth. We lost the family groups as we walked past Stainforth Church as they were seemed to be staying around the village. We were now beginning our long and steep ascent to Pen-y-ghent. 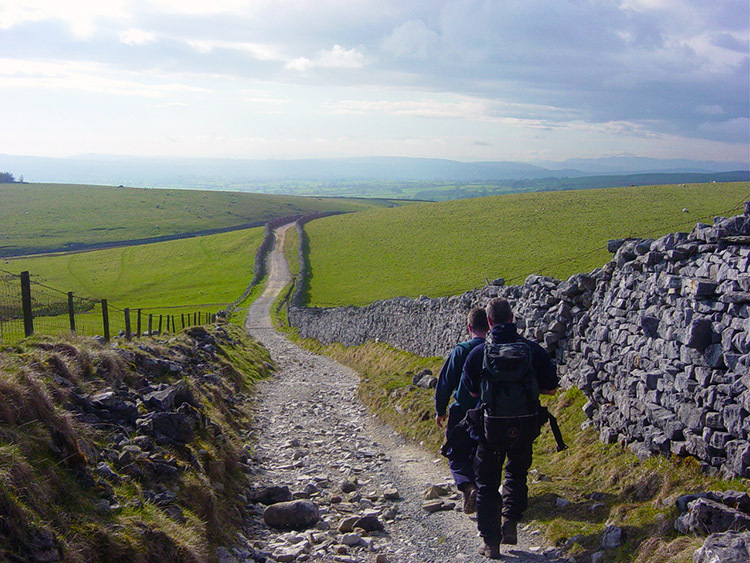 The climb out of Stainforth took us from society and into solitude. We were the only walkers on the trail now. The climbing was constant and we made our first 100 metres ascent in less than a half mile before stopping for a drinks break and observing the toy sized cars and motorcycles riding along the road between Stainforth and Helwith Bridge below our vantage point. While discussing the chances of the motorcyclists getting copped for speeding during their weekend zooming through the park we caught our breath and then continued our steep ascent onto the fells before arriving at the path crossroads with Moor Head Lane where the climbing became a little less steep. From Moor Head Lane we caught our first views of Pen-y-ghent. It is a marvellous hill and justly Steve's favourite. Our southern approach was leading us to Churn Milk Hole and during this section I took a few photographs of the hill and fell behind. Although the sciatica of yesterday had gone I was still a little sore in the back and did not attempt to catch up. Instead I kept the boys in my sights about 100 yards ahead. At a stile they waited for me and now reunited we made on to Churn Milk Hole. For the first time we were now walking in boggy ground and typically for this time of year (the ground was still drying out) we meandered our way trying to keep to dry sections but often wading through spongy water. 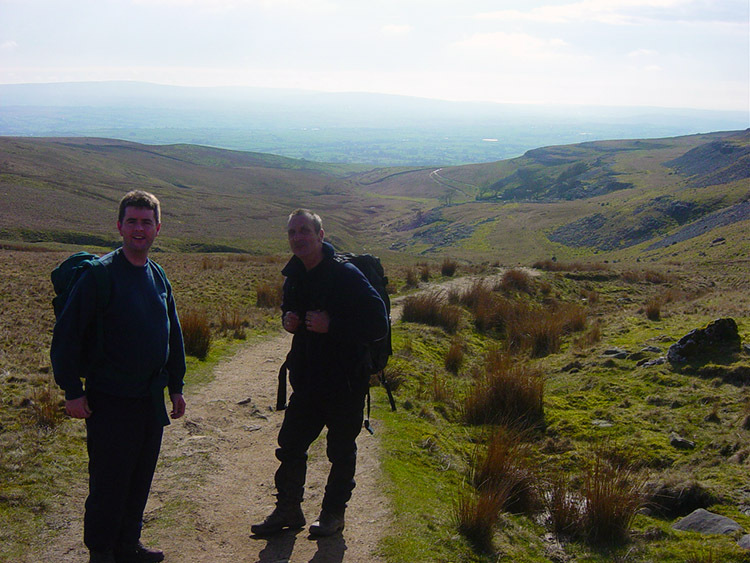 Eventually Churn Milk Hole was reached and Steve and Chris set off in earnest towards the lower reaches of Pen-y-ghent. I was jiggered temporarily and had to stop for the Red Bull booster I had bought in Settle (yes, we had all bought one for today on Steve's provident advice). They were saving theirs. I needed mine now! 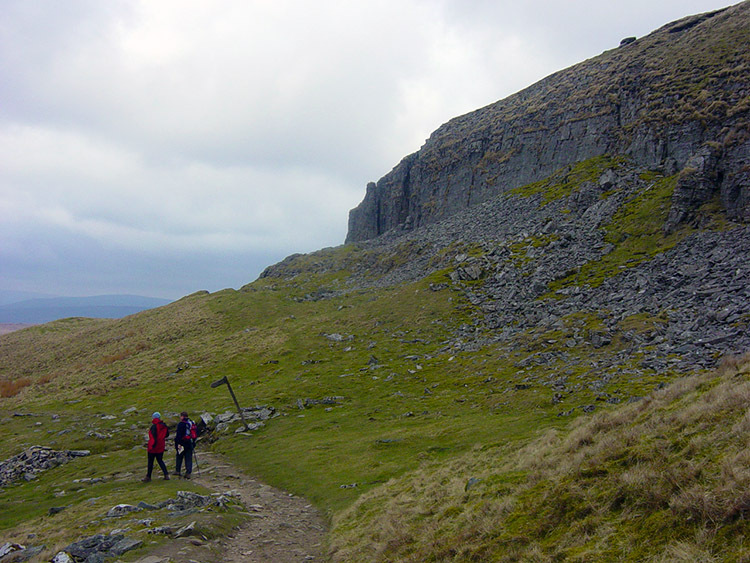 After the Bull boost I began my struggle up Pen-y-ghent while intermittently looking up to Steve and Chris ahead of me. The climb up the southern face is dramatic. It is steep but that is the best thing about a hill for you gain he height in no time. And in a short but sharp climb we made our way up onto the top plateau and on to the trig point of this fantastic hill. We rested at the top for a short time to capture the moment and the views. It was here the kleptomaniac of yesterday made himself known. While we were sitting having a drink I said to Chris "That's amazing. Your hat is the same as mine, did you get it at Alders?". He replied "Can't remember" and only after my looks of puzzlement did he admit "I must have picked it up by mistake yesterday during that first drinks break and put it in my rucksack by mistake, it's yours" Slow to twig yes. Tired mind yes. Hat reclaimed we left Pen-y-ghent. The sun had broken through nicely as we had climbed Pen-y-ghent and although it had been blustery on top it was becoming a lovely spring day. As we descended from Pen-y-ghent on the Pennine Way track down to Tarn Bar I forgot about my struggles of just a short while ago. The back pain had certainly gone and with the sun breaking through I felt like a new man. Even the concentration needed on a walk downhill was not too much of an inconvenience. Still under the adrenaline influence of the Red Bull or not, it did not matter, for the climbing of the first of the three peaks had convinced me I would complete this walk. Up until now the worries about my back had been a serious concern. Now I shall mention it no more. I even took the lead for a while on the way to Tarn Bar, the first time I had done so this day. Another benefit we were enjoying now was the fact we were walking on a good dry track. We had left the boggy ground behind on the final push up Pen-y-ghent. Walking on good ground is another determining factor in feeling good during a walk. 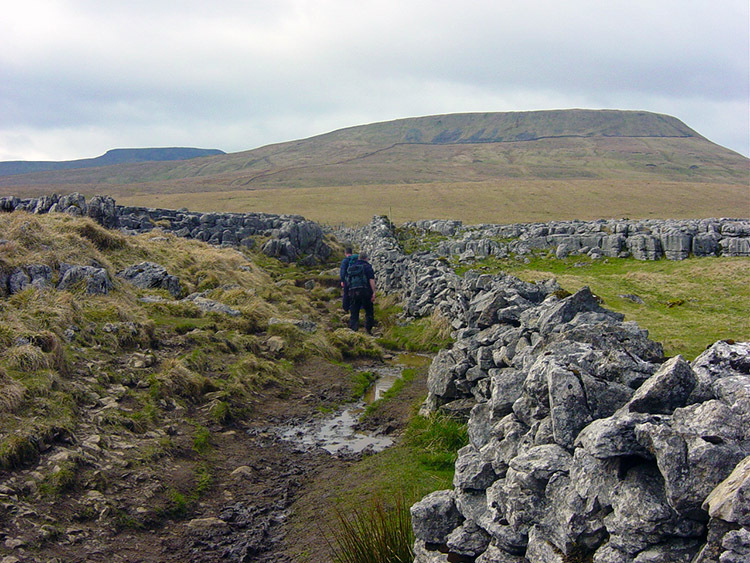 Walking in the dry is not what Pen-y-ghent is about though. Steve and I recalled our previous walks up of which there have been many. I have praised the hill many times for it is special and an attraction to the eye from every angle at distance but it can be a pig to walk. We talked about the times we've crossed over its top ridge to Plover Hill and Foxup Moor. We would then descend the hill to Swarth Gill Gate and follow the track to Horton Moor and Hull Pot. Every time we did so we would get blathered in mud for even in summer the route is a minefield of bogs. Sections of it were often boarded to ease passage but even the boards would sink into the quagmire. Oh, we must do it again sometime! Back to the present and we reached Tarn Bar and passed up the opportunity to walk to Hull Pot. At a gate the open moor is left and for the next two miles the walk takes us along a walled bridleway into Horton in Ribblesdale. Steve hates this section. I knew this and now Chris does too for he went on and on about it during the walk along the bridleway. "I hate this bit having to walk on hard stones. Its boring, you're closed in by these walls and the stones kill your feet" he exclaimed. He always does. I agree it is not fun but there is no choice and I frequently alleviate the tedium by looking to my left at Pen-y-ghent and recalling the time spent at the top. In the foreground between the track and the hill there is also Horton Scar to gaze upon with its sunken holes and limestone outcrops. But the feature that I most look at during the bridleway section is a copse of trees just to the left of the bridleway which are near Horton. They always attract my eye and I know that when I have reached them the bridleway is all but done. As usual I gazed at them several times as we walked down and on each look they were closer. I looked at them as we passed. Then they were gone until the next time. We immediately made a right turn on the track and walked down at a markedly steeper rate into Horton. We were now more than half way to Ingleton and in the village took a break at the cafe. 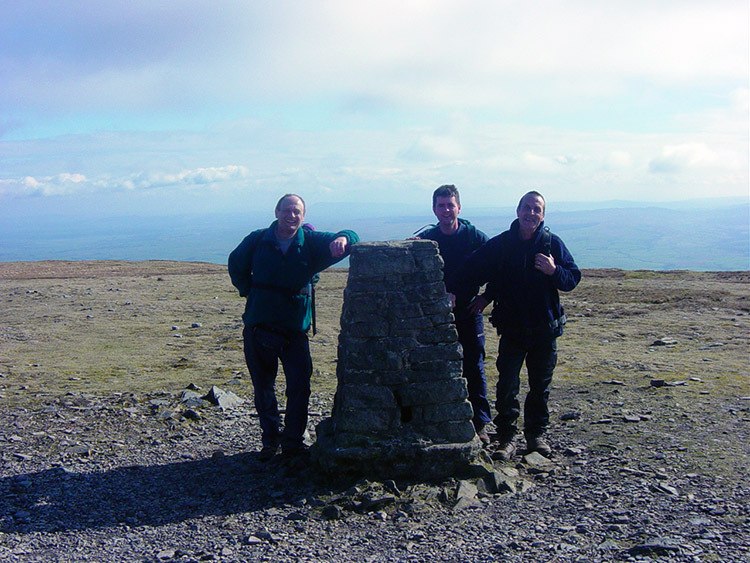 The cafe is well known to most people who have done the 'Three Peaks' challenge for it is the traditional starting point. There is a book to sign in which walkers record their names and setting off times. 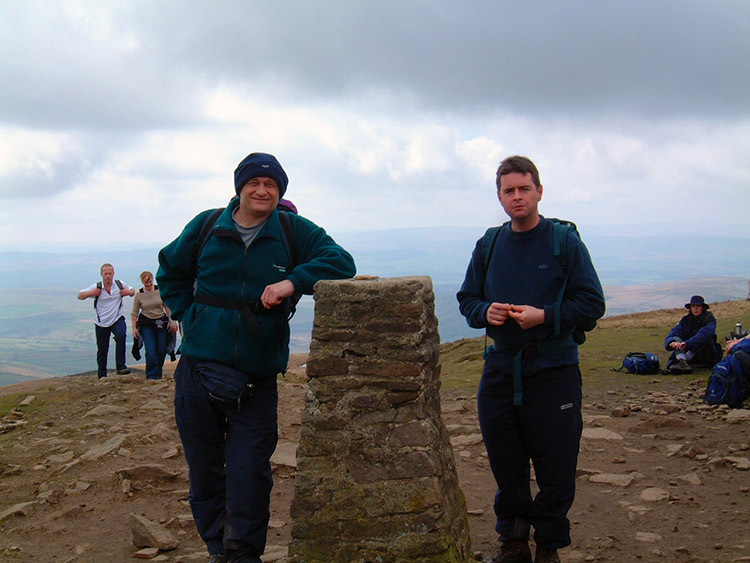 Steve has done the three peaks quite a few times and I have done it on three occasions. I don't think either of us has ever signed the book. At the cafe we took advantage of the sunshine and sat outside on a wall. We all took a refreshments break. I bought myself a big mug of coffee and enjoyed it thoroughly. We rested a while and prepared ourselves for Ingleborough the second of the hills to climb on this 'two peaks' day. We walked off and left the village behind by way of Horton Railway Station by crossing the Settle to Carlisle railway line. Once over the line we walked through a gate and into a field which skirts past Beecroft Hall. The field is a long one but once it is left via a stile the open fells are rejoined. As we did so I looked forward to the next few miles. This is due to the pleasant walking on a fairly gentle incline through limestone channels which are the feature of this wonderful section of the walk through Sulber Nick. As we negotiated our way on this lovely section we came across many other walking groups, not surprisingly as I recalled it was not only my birthday today but also Easter Sunday. At one point while walking through a narrow channel of limestone we passed a group of five ladies. We began a conversation with them and they asked where we were going. "We're doing a new long distance footpath around the Yorkshire Dales called the Dales Celebration Way" I said. "Oh that sounds lovely" replied one of them. Another lady went on to ask "Where does the walk go? How long is it?" I continued "It was designed by The Walking Englishman. He's created a walk to include the best of the Yorkshire Dales. 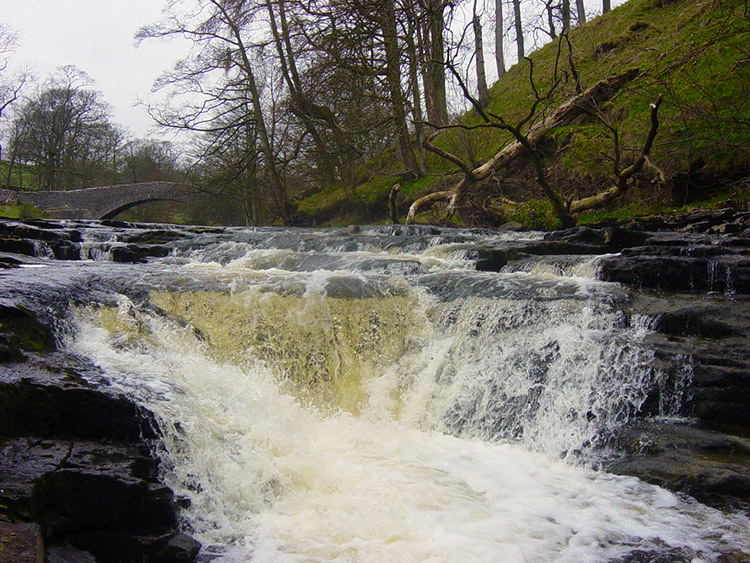 It is 130 miles long and visits many of the best sights in the Dales in a circular route". The ladies were all impressed. "Incidentally, I am the Walking Englishman!" They were all now certainly excited but I had to leave them in awe. They promised to visit the website and read about the walk. Steve exclaimed "My hero, you had them all excited there". After the meeting we made our way over a stile and took a break at Nick Pot. The level walking of Sulber Nick was now behind us and ahead was the climb to Simon Fell Breast with Ingleborough beyond. Time for Chris to have his Red Bull. He had done well today but admitted he needed that burst of energy for the final climb of his walk. The youngest member of our walking team was now tiring. 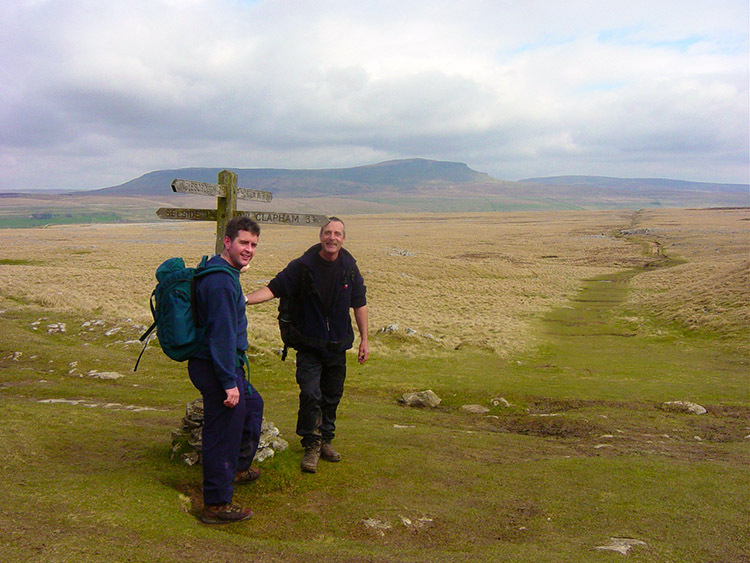 After the final break at Nick Pot we started our climb towards Ingleborough. Steve usually leads the uphill sections but not this time. The Red Bull boost surely worked for Chris for he was walking briskly almost immediately. He did not just walk a few steps ahead of us. He disappeared into the distance getting further and further away as we made the steady relentless climb along Simon Fell Breast. It was an impressive effort and a suitable way for Chris to make his final ascent before his departure from Ingleton back home to Rugby and the loving arms of Vicky. Perhaps it was the thought of being reunited with Vicky that had Chris trotting off up that hill. I imagine so. Steve and I did remark on his sudden vivacity with some awe. Before the Red Bull moment he had been decidedly wearisome. Chris did not rush to the top of Ingleborough in one concerted push though. Before the final steeper climb from Simon Fell onto the top he stopped to wait for us at some rocks. Once there he was approached by a young woman who was with a group of walkers who joined him in conservation. They were still in conversation when Steve and I caught up with him and we too joined them for a chat. What a lovely place to be friendly and pass pleasantries. She was interested in our walking adventure. Now rejoined with our Billy Whizz we said our goodbyes to the lady and her group and made our way to the top of Ingleborough. We stopped briefly and enjoyed the marvellous views the hill provides before heading down towards Crina Bottom. The day was at its loveliest now and we enjoyed our final walk with Chris off the fell, along Fell Lane and into Ingleton. Chris thanked me for planning the walk and thanked Steve and I for the company. We thanked Chris for his. Then we walked all the way around Ingleton trying to find where Chris had parked his car. We must have done a full circuit of the place and done an extra mile before we found it! We then said our final goodbyes to a knackered friend, Red Bull influence having now worn off. It was great having you along Chris.